The National Student Clearinghouse® provides cost-effective transcript services and educational research services that help U.S. high schools and districts improve college readiness and success. 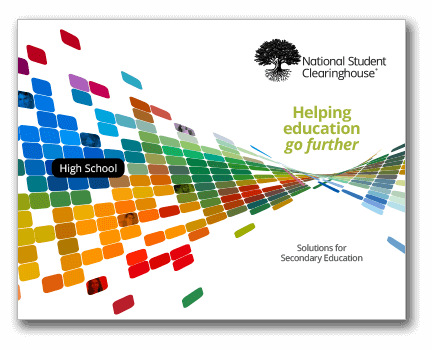 A look at how the National Student Clearinghouse helps education go further with solutions that serve the K-12 Continuum. StudentTracker ® for High Schools: Enables you to follow your graduates’ transition to college by querying our participating institutions’ postsecondary enrollment and degree records. StudentTracker® for Outreach: Helps measure the college success of participants in outreach programs, such as Gear Up. Free research reports: Our Research Center publishes reports on student pathways, student outcomes, and enrollment trends throughout the year. You can read all of our free research reports at http://nscresearchcenter.org. Electronic Transcript Exchange℠: Enables you to exchange electronic transcripts with your trading partners, like other high schools as well as postsecondary institutions, via the Clearinghouse’s secure network. Clearinghouse Transcript Center: Through our service, high schools, school districts, and postsecondary institutions can securely send and receive transcripts.